A valentine portrait, a photo by The Bacher Family on Flickr. 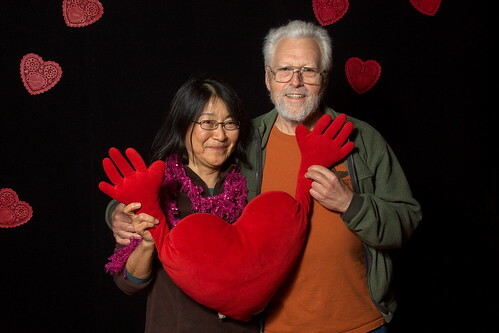 For Valentine's Day at work, we set up a photo booth and invited individuals and couples to pose for photos. As you can see in these photos, people had a great time posing both for relatively traditional portraits and also dressing up with costumes or striking fun poses. You've got to love the creativity of park rangers! It was an interesting challenge for me, as a photographer, to try to get good pictures with only the limited light resources I had available, i.e., a single 430EX off-camera flash shot through an umbrella to soften the light. Yes, we had a big picture window with indirect natural light, but it was far too dim to be of effective use, and the lights in the community building are notoriously low for camera work. I think we mostly succeeded in spite of the difficulty, though I had to switch out batteries early on because they weren't high powered enough, leading to too much variability in the flaash power, and were dangerously overheating when I took them out. The Enloop rechargeables got warm but did a much better job of keeping up with the demand. In future, I would want to improve this lighting setup in two ways: first, with a second light camera-right to balance the one we had camera-left, and to help with the lighting load; and second, with a bit of a hair light to provide separation between the dark hair and the dark background (though some of this was helped by having the subjects stand farther in front of the backdrop, thus providing greater differential between the lighting of each). Breaking news, a photo by The Bacher Family on Flickr. 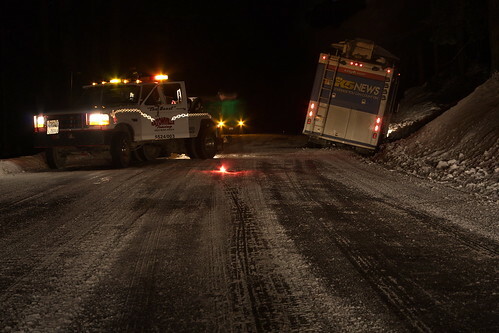 On my way home from Longmire one day in January, My friend Crow and I got stuck behind a King 5 TV satellite truck that got a little too far over into the ditch and needed to be pulled out by a tow truck. Well, we were stuck anyway, so why not take some pictures, right? I got out my tripod and took some long exposures using available light, leading to some interesting light blur effects as the workers moved around, and great starburst patterns in the stationary lights. Rudolph in the Rein, a photo by The Bacher Family on Flickr. 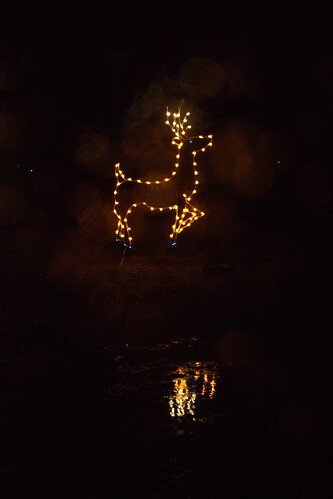 After Christmas, we made our annual trip up to Spanaway Park see the Fantasy Lights display. Every year, I bring my camera along and make a valiant attempt to get good photographs of the lights from the moving car. To do it right, I'd really need to walk the course with a tripod, but I don't know if that's even allowed, and it's invariably cold and rainy when we get up there anyway. Even so, I'm really, really pleased with this image I managed to get. With the darkness and dampness and the lights reflecting and refracting everywhere, it turns into a somewhat impressionistic image, not my typical style of photograph, but all the more special to me because of that. I like it. 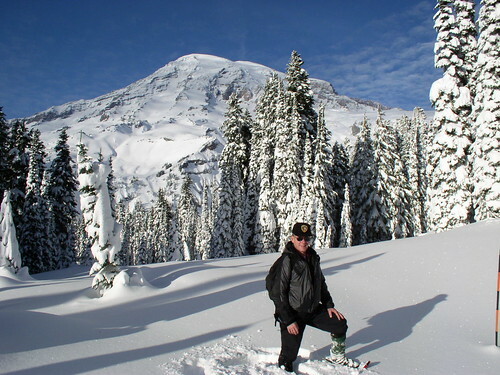 Lloyd on the Nisqually Vista Trail, a photo by The Bacher Family on Flickr. 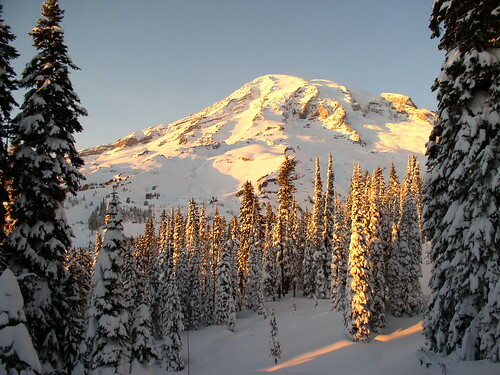 In honor of a rare, beautiful winter day here on Mount Rainier, here are a set a photos from another rare, beautiful winter day back in December of 2003. This was Winter Operations Training day for that season, which involved learning how to drive the park road safely, use park radios, operate avalanche beacons, and deal with hypothermia, among other things. We ended the day with a snowshoe hike out to Nisqually Vista. There's nothing more beautiful than the wilderness in fresh snow, especially with a great white mountain looming over it. Of course, with all that white, exposure can be challenging. The internal light meter of a camera can misinterpret the white as overexposure and compensate by underexposing the image, turning it dark and gray. Many point-and-shoot cameras avoid this by having a "snow" setting, which basically reassures the internal light meter that all that white is, in fact, normal in this case. I'm not sure whether I was using such a setting on my Olympus C4100 back in 2003, but whatever I was using, it worked quite well. 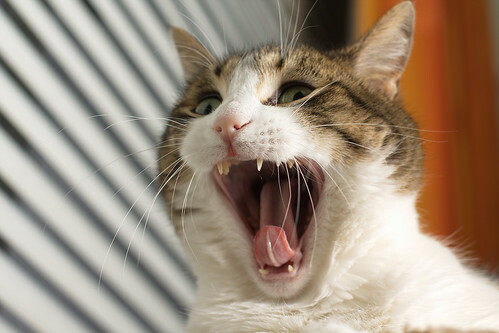 It's a reminder that regardless of how fancy your camera is (or is not), you can still take great photos. 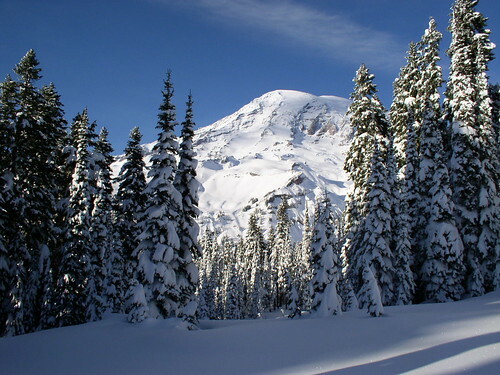 The top image in this series, in fact, was so good that it was used as the masthead for the Winter edition of Mount Rainier National Park's visitor guide, "The Tahoma News," from January-April 2011. 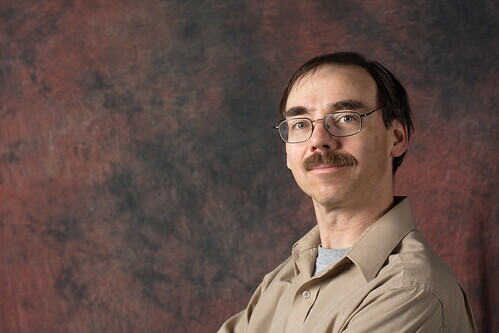 My good friend Lloyd, who was learning the ropes as a volunteer, ended up cropped out of the long, narrow banner version of the photo. 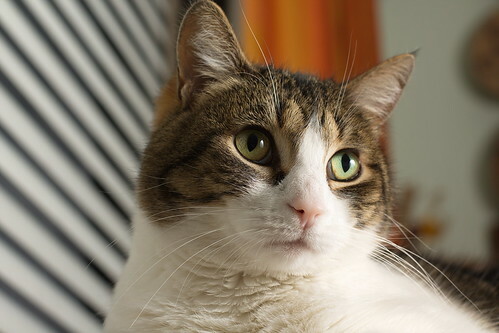 Collared, a photo by The Bacher Family on Flickr. 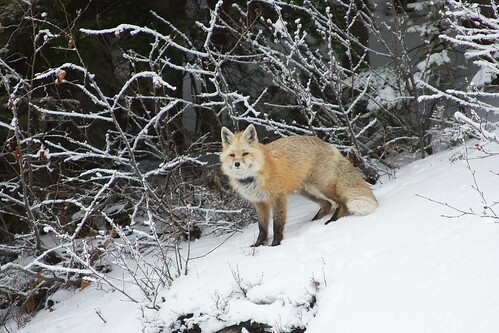 On my way down from Paradise in Mount Rainier National Park in January, I spotted this fox along the side of the road in the snow and pulled off in the adjacent pullout to snap her picture, and then to chase her away. Red foxes like this one have become a bit of a pest in the park, begging for food and walking out into the roadway to stop cars, leading to several near-misses and near-accidents as people swerve to avoid them, and several fox fatalities over recent years. And of course encountering a tame fox begging for food is a very different experience than seeing one acting natural in its wilderness habitat. The latter is the experience we seek to preserve in a national park. Because of this, the most notious offenders like this one have been GPS-collared to track their movements and to help resource managers get a handle on how to resolve the problem. Still, you can't deny what a thrill it is to see a red fox alongside the road under any circumstances, and how beautiful it is, in full winter fur, standing in the fresh snow. Sentinel, a photo by The Bacher Family on Flickr. I drove up to Paradise in early January to take some photographs. 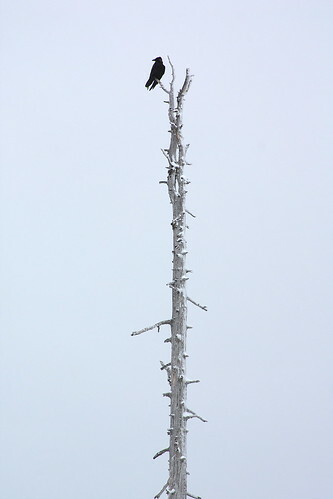 As I was parking my car, I spotted this raven perched on a snag acrossthe parking lot, and the stark, near-black and white colors and simple composition caught my eye. I snapped a series of photos, as the raven turned this way and that and ruffled its feathers; this one is my favorite, with the bird looking back over its shoulder into the vast open space of the sky, perched above the wilderness of Mount Rainier National Park. 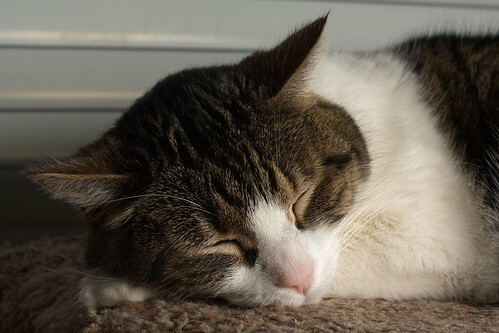 Snug as a bug II, a photo by The Bacher Family on Flickr. Kids have always loved boxes, especially big boxes that they can turn into space ships and club houses and time machines. Or, just to curl up in and read a book! I don't even remember what this cardboard box originally contained, but it didn't take long for Kiley, at Christmastime, to turn it into a cubby hole to share with her stuffed puppy. And for the sake of photography, the box creates a nice frame for a happy face looking up from the shadows. 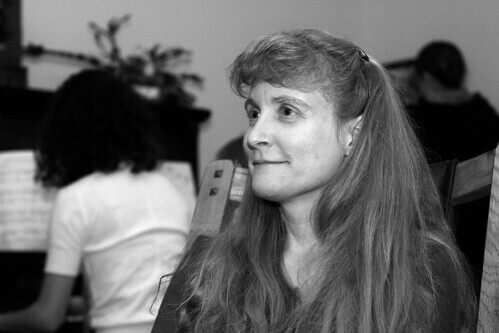 Cindy, a photo by The Bacher Family on Flickr. 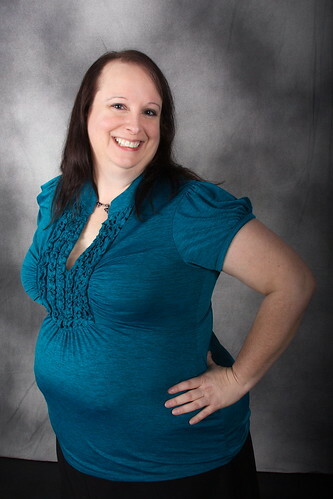 I captured this image of our friend Cindy at a Christmas party. I don't really have anything profound to say about it, except that I love the way it came out in black and white, with nice contrast and texture. Cindy has a beautiful and expressive face, and I think this image does a great job of showing that. 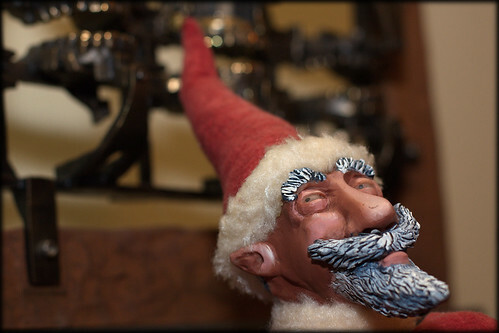 St. Nick, a photo by The Bacher Family on Flickr. Photographing in the home and studio of an artist is a lot of fun. The artist in this case is Chris Bivins, a good friend and one of the most creative people I know. The challenge as a photographer, of course, is to capture not only the artistry of the work, but also the artistic style, while also expressing your own creativity in the image. 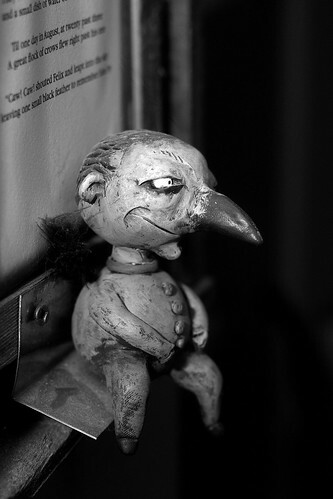 Chris's style is whimsical with an undercurrent of macabre, unique but similar to the style of the filmmaker Tim Burton. I composed this image off-center in an attempt to mirror that sense of being a little bit off center of normal in Chris's art, with a narrow depth of field to make the sculpture stand out from the odd and unidentified shapes in the background. Santa's mad ride, a photo by The Bacher Family on Flickr. I love the whimsy and imagination in this piece by artist Chris Bivins, of good old St. Nick aloft on a Canada goose. 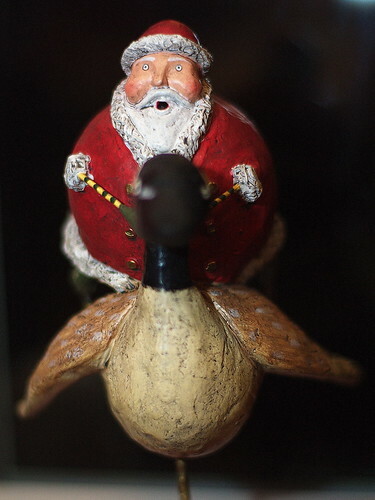 The very idea of it makes me smile -- who would think of putting Santa on a goose? -- but the execution of that idea is even better, with the look of exhileration -- or astonishment -- or terror -- or all three on Santa's face. I chose to photograph the piece straight on to give a sense that the goose is flying straight out at you, and because the lighting is so good this way, with hightlights on one side and shadows on the other, almost as it would be in a studio or lit by the full moon. I positioned the piece in front of a dark window, used a shallow depth of field, and aimed the flash away in order to preserve the black background that isolates St. Nick as if he were flying through the night sky. Tale of a tail, a photo by The Bacher Family on Flickr. Sometimes the best ideas come spontaneously while you're shooting something else. You're focused on a beautiful face, and you glance to one side and say, what the hell, let's get a shot of that nice tail of hers while we're at it... and it turns out to be one of your favorite shots of the day. 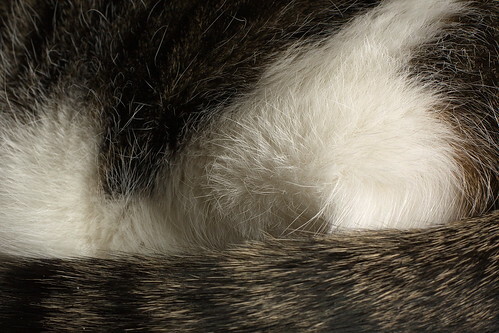 And let's face it: this is one cat with a nice tail. Christmas program, a photo by The Bacher Family on Flickr. 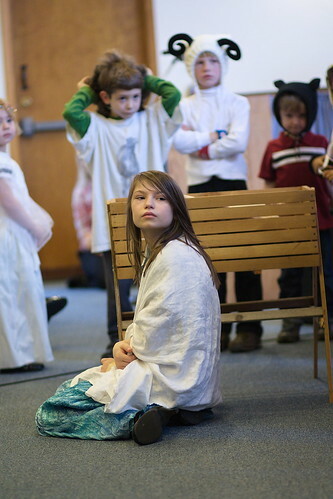 Whoever dressed this young woman for the church Christmas program did a marvelous job. You've never seen such a look of pure innocence! 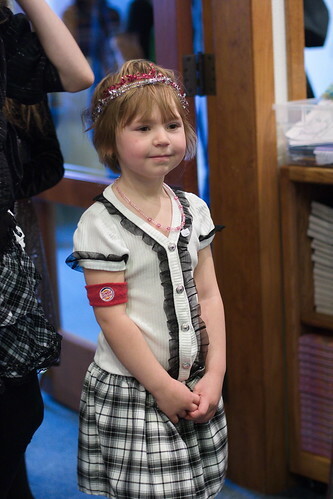 She's so poised, and she wears her tiara and pearl necklace with such aplomb. The Burger King arm band matches the ensemble perfectly. She's playing her part, and happy to contribute to telling the story of the birth of Christ the King. Mary's vigil II, a photo by The Bacher Family on Flickr. Before Christmas, our church had its annual Christmas program, involving kids dressed up in angel costumes, a manger with a doll in it, and someone to represent Mary, the mother of Jesus. 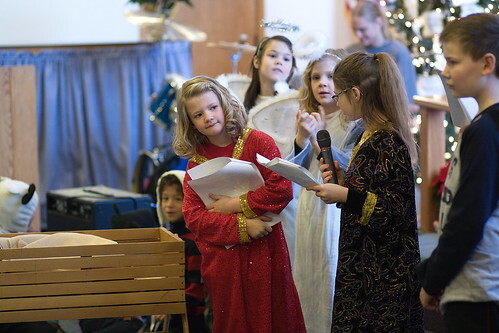 With the younger kids standing restlessly around her between songs, tugging at their costumes, "Mary" was the very image of stillness in the midst of chaos, much as she's traditionally represented in scenes of the manger. I love the contrast in these images between the younger kids in the background and Mary in the foreground. 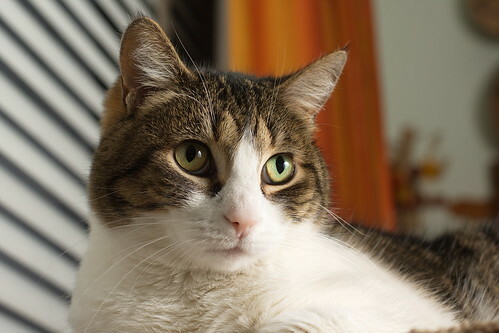 My Model, a photo by The Bacher Family on Flickr. Coming up in a few days, we're going to have a Valentine's Day party at work, and as part of the fun, we're going to set up a photo booth where people can get their pictures taken with some fun props. 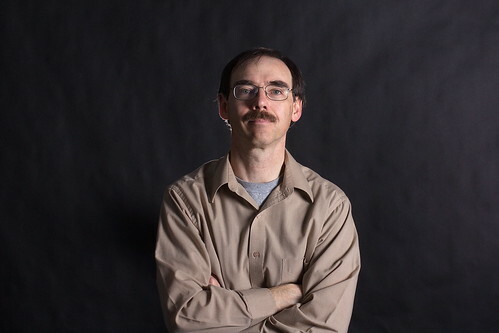 My good friend and colleague Crow walked over to our Community Building with me to experiment with some lighting setups. All I had was a large picture window (camera left) with diffused light reflecting off the snow, and an off-camera flash with a long flash cord. To get this picture, I held the camera in my right hand with the flash in my left, and reached across my body to aim it from camera right. The previous test shot showed that that produced too harsh a light with too many highlights, so we diffused the light through a sheet of paper on a flip chart, which Crow held in the proper position with her left hand. It would have made a great image, if there had been another person to photograph it! The result, however, was the one we were looking for. We'll go back in a few days with the right equipment: a light stand, umbrella, and remote flash trigger; and we'll keep the flip chart to serve as a reflector. It all goes to show, it doesn't matter whether you have $10,000 lights or a cheap flash and a white flip chart -- all that matters, in the end, is that the right light gets to the right place to make a great photo. Memories of summer, a photo by The Bacher Family on Flickr. Over the summer of 2011, we spent several days at Fort Stevens State Park, camping, biking, and walking on the beach. The sunsets were fantastic. 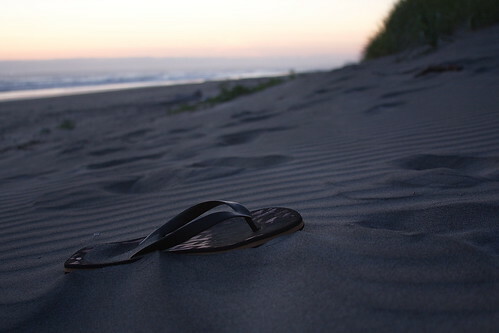 One evening I came across this solitary sandal (a sole sole) abandoned in the sand. 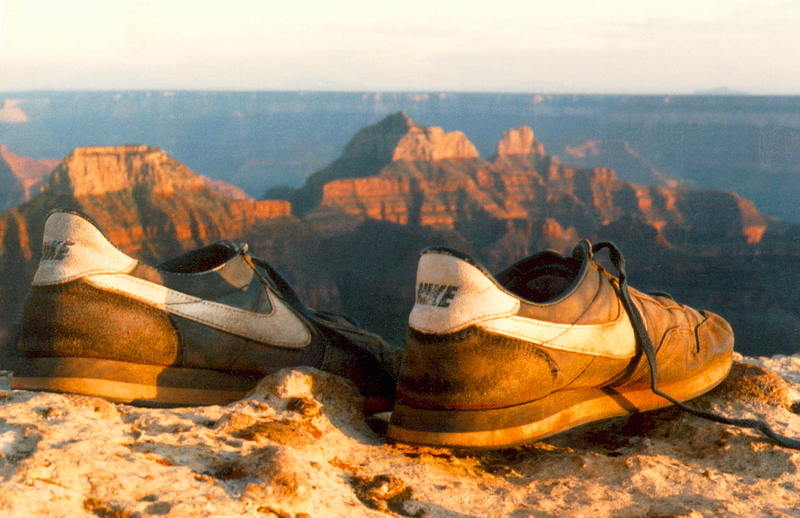 Such artifacts intrigue me the way chips of rock capture the imagination of archeologists. What's the story here? Who left this piece of footwear behind? Did they change into leather boots and march away,or skip off in bare feet? What experience did they have along the ocean? Did they build sand castles with their children, or share a picnic with a lover? The only one that knows is the sandal, and it's not saying; so all we can do is wonder, and guess. 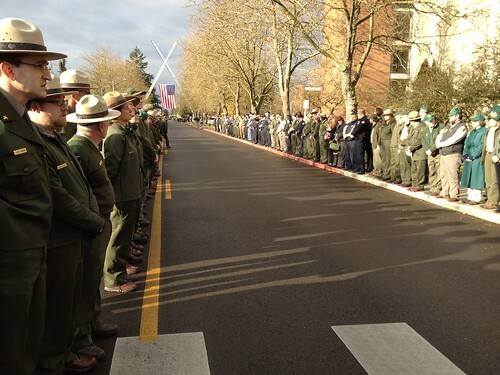 God bless our rangers, a photo by The Bacher Family on Flickr. 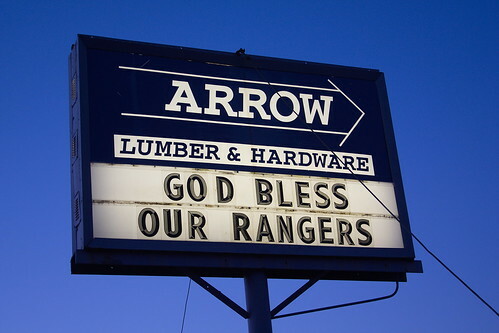 As we walked up the hill from where we parked our car, on our way to participate in a candlelight vigil to honor our friend and coworker Margaret Anderson, who had been killed by a gunman while on duty in Mount Rainier National Park the week before, I stopped to take a photograph of the sign at Arrow Lumber. Messages like this had gone up all over Eatonville, Elbe, and Ashford, letting those of us who commute to work know how much the community supported Margaret's family and friends. It was incredibly comforting. It's just a simple image of a sign, but I am so pleased with how this one turned out. The lighting within the sign caused the automatic exposure in the camera to darken the image in response, and so the pale blue sky of early dusk turned deeper, making the colors more intense. Ed Troyer, a photo by The Bacher Family on Flickr. There are those whose job it is to speak about evil. 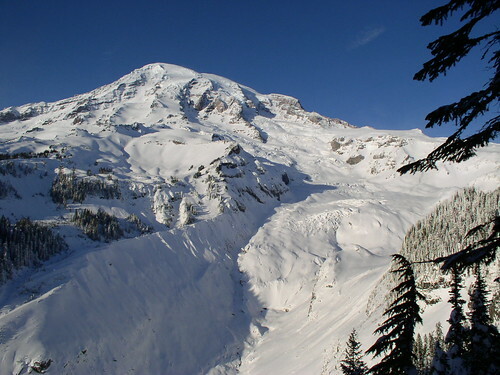 I serve on the Public Information Team at Mount Rainier National Park, and now and then, I'm called upon to speak to the local press about a tragic accident on the Mountain: someone has gone missing, someone has fallen while climbing, someone was caught out in a blizzard. These events are hard and sad, but they are usually without malice. Mount Rainier, regardless of how it is anthropomorphized, does not seek to kill or injure; it just is. The outcomes of an event on the Mountain may be positive or negative, but they are neither Good nor Evil. 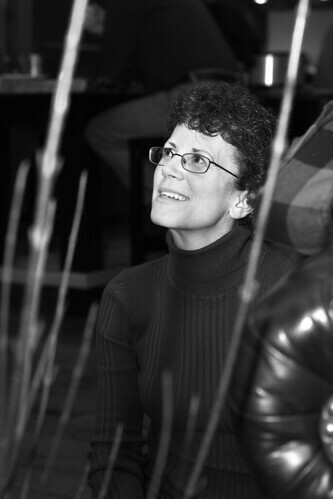 The loss of my co-worker on January 1, 2012 was different. It was a crime. It was evil. Someone came to our park with malice in his heart, and his Evil act took the Good ranger Marget Anderson away from us. This made our jobs as public information officers infinitely more sad and difficult. Which brings us to this photograph. 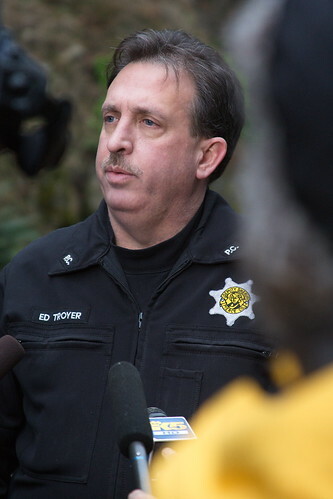 I took this image of Ed Troyer, detective and spokesman for the Pierce County Sheriff's office, as he answered reporters' questions at the entrance to the park on January 2nd. I actually like the fact that it's shot over the shoulder of one of those yellow-jacketed reporters, blurred in the foreground -- rather than ruining the shot, it gives it a sense of cinema verite, like when directors use hand-held cameras to convey action and a sense that "you are there" in the scene. But what really makes this shot for me is not the composition but the emotion I caught on Ed's face. He sounds so strong on the radio, but even there, you can often hear the emotion in his voice, the anger at the actions of evil men (it's almost always men), the sadness of an unnecessary loss, the frustration at an unprevented evil. And in this image you can see it on his face: the strength, the concentration, but also the weariness. He does this on a schedule that varies from every day to all too often. I don't know how he does it. 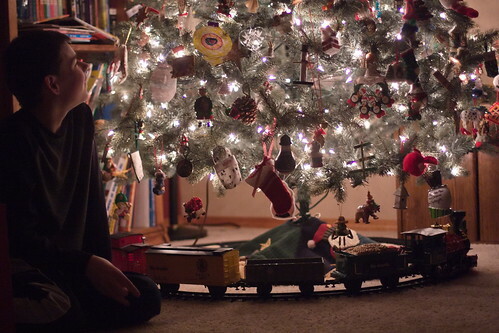 Christmas eve, a photo by The Bacher Family on Flickr. The light of a Christmas tree is so beautiful, and the look on a child's face by that light is enchanting. And there's nothing more fun than sitting in the light of a Christmas tree after you've finished decorating it! Sweet geometry, a photo by The Bacher Family on Flickr. 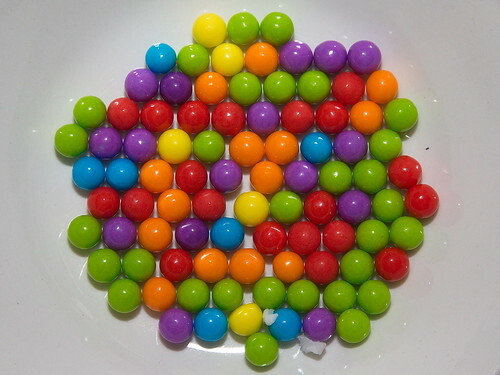 As my boys and their cousin built gingerbread houses this year, a dish of candies caught my eye, and I was intrigued by how the spherical candies in the shallow dish assembled themselves into a neat geometric pattern. Of course, I had to take a picture of it! (40) Dancing on the beach, a photo by The Bacher Family on Flickr. I took this picture of Daniel several years ago, on vacationin Oceanside, Oregon. How young he was then! One thing I've always loved about both of my boys is how expressive they are in everything they do. 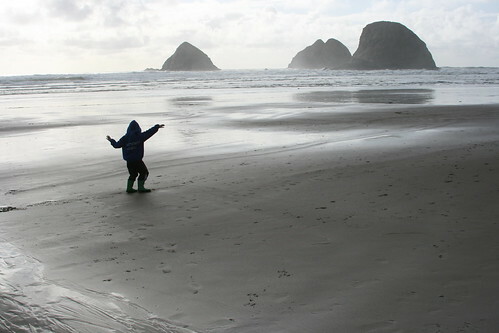 Here, Daniel was playing on the beach, but he might as well have been dancing. The evening light and slight silhouette add to the empty beach and the ocean stretching away into the distance to create, for me, a sense of space and solitude, with Daniel in the middle, dancing to the beat of his own drummer.